Anemia in dogs is a condition in which the dog does not have enough red blood cells to transport oxygen to different parts of his body. Anemia is a symptom of an underlying problem. If your dog is anemic, be sure to take the dog to the vet for a thorough check-up to find out and accordingly deal with the root cause. When we think of anemia, many of us will connect the condition with iron deficiency. While anemia caused by iron deficiency is more common in people, this condition is rare in dogs, although it can sometimes be found in dogs with malnutrition and puppies with hookworm infestations. The dog is panting, has labored breathing and a fast pulse. If anemia is caused by internal bleeding due to ulcers for example, the dog's stools are much darker - even black and tarry-looking. If a dog has serious anemia, he may have heart murmur and rapid heart beat. If under exertion (e.g. strenuous exercise), the dog may collapse. Toxic or chemical poisoning. For example, it has been found that use of "Spot-on" flea control can cause anemia (and liver damage). As mentioned above, anemia in dogs is a symptom of an underlying health issue. In order to cure anemia in a dog, the vet has to identify and treat the underlying health issue that is causing anemia. For example, if a dog's anemia is caused by worm infestation, then the vet has to deworm the dog. If the anemia is caused by a stomach ulcer, the vet will need to find out what caused the ulcer and treat it accordingly. If a dog has severe anemia, blood transfusion may be needed. 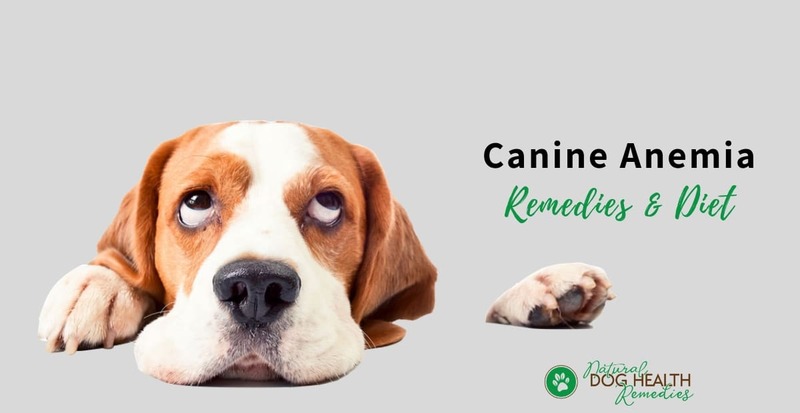 While the underlying condition is being treated, you can definitely use natural home remedies to stimulate the growth of new red blood cells in order to help your anemic dog restore some strength and energy. Let's take a look at what we can use to achieve that. 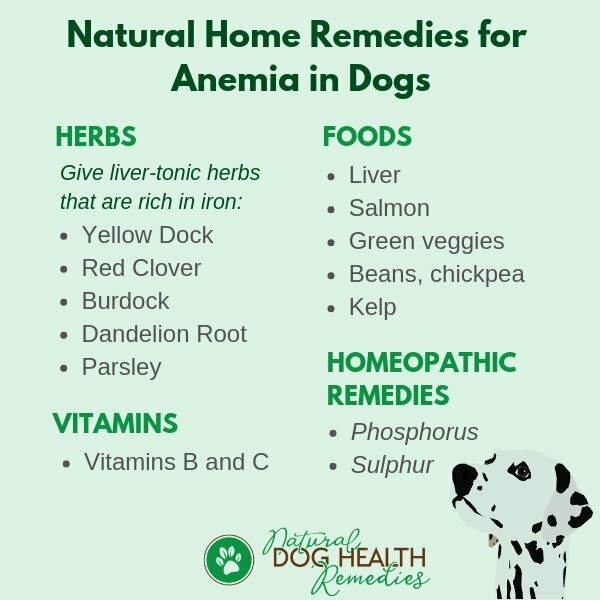 Herbs that are rich in iron and are liver tonics (liver is important in producing blood cells as well as cleansing the blood) are effective in helping dogs with anemia. Vitamin supplements should also be given to an anemic dog. In particular, B vitamins are essential in strengthening a dog's bone marrow, which is responsible for producing red blood cells. Supplementing an anemic dog with B vitamins (especially B12) is therefore helpful. Vitamin C helps the body to absorb iron from the intestinal tract. This formula contains ingredients such as liver powder, herbs like yellow dock, red clover, raspberry, etc., which are rich in RNA/DNA, iron and vitamin B12 - all essential for the formation of red blood cells. Many dog parents have seen very positive results in their anemic dogs after supplementing them with this supplement. It's definitely worth a try if your dog has anemia. A diet rich in iron, vitamin B12, and protein is essential in helping the production of red blood cells. Phosphorus: This remedy is effective for treating bleeding and anemia. Dogs needing this remedy are thin, chilly, hungry and thirsty. 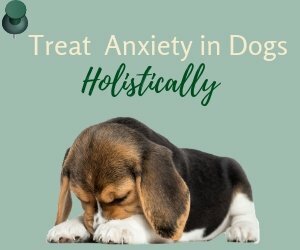 You can start off by giving your dog 3 pellets (30C) three times a day for about 3 days. Sulphur: If Phosphorus does not help, try this remedy especially if your anemic dog is flea- or worm-infested. 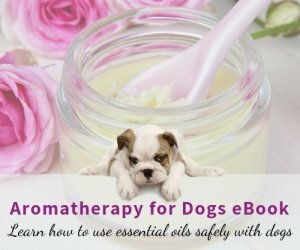 Dogs needing this remedy also tend to have skin problems (dry, rough coat and flaky skin) and a poor immune system. 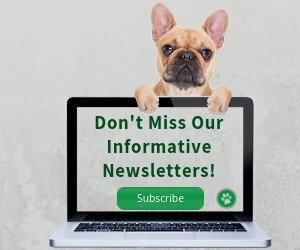 You can give your dog 3 pellets (6X) two times a day for up to 2 weeks. Since some parasites (e.g. intestinal worms) can cause blood loss in dogs, make sure that your dog is free from parasites! Also keep your dog flea free. If your dog is heavily infested with fleas, chances are she will lose quite a lot of blood over time. As mentioned above, some flea products (e.g. Spot-on) may actually cause anemia in dogs, so try using natural flea control as much as possible. Some medications such as NSAIDs can cause stomach and intestinal ulcers in dogs, which may result in anemia. Use NSAIDs with care and under supervision of your vet. If at all possible, avoid long-term use of such medication. For example, if your dog has joint pain, try using different natural remedies to soothe the pain. By adopting a holistic approach, you may eventually be able to reduce the drug dosage. Better yet, you may find that your dog no longer needs all the drugs! D. Hamilton, Homeopathic Care for Cats and Dogs (North Atlantic Books, 1999). 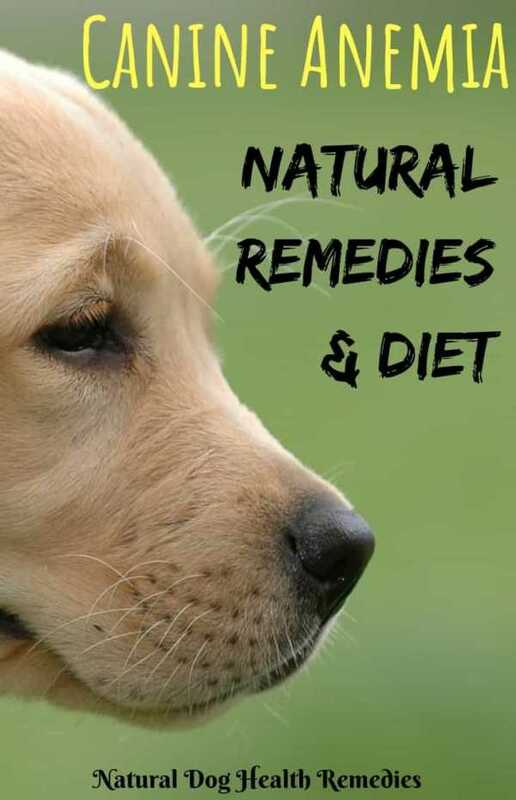 L. Olson, Raw and Natural Nutrition for Dogs: The Definitive Guide to Homemade Meals (North Atlantic Books, 2010). Wounds and injuries can cause excessive blood loss. Check out this page to learn how to treat wounds and stop bleeding.